But the Blackmouth they are biting. You’d better go, better go, better go. Okay, that was a little over the top, but at least you didn’t have to hear me try to sing it. I guess it’s just that festive, end-of-the-year spirit; after all, ‘tis the season, winter Blackmouth season, that is. It’s the salmon angler’s version of winter steelheading, and it’s not for wimps, but it sure beats sitting around the house stuffing wood into the fireplace. 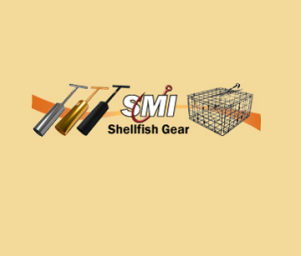 And most importantly, it’s happening now in eight of the 10 marine areas of Washington’s “inside” waterways from the eastern end of the Strait of Juan de Fuca to the south end of Puget Sound, and the two areas currently closed will open to fishing in the coming weeks. For the uninitiated, “Blackmouth” is the term used to describe immature Chinook salmon that hang around our “inside” waters rather than hot-footing it out into the open Pacific to feed for most of their lives. 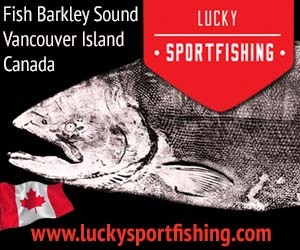 The name comes from the dark gum line that helps distinguish the chinook from other Pacific salmon species. And it should be pointed out that “immature” doesn’t necessarily mean small. Yes, many of the Blackmouth you’ll catch during a typical Washington winter will weigh in at three to seven or eight pounds, but 10-, 12-, 15-pound fish are common enough to keep it interesting. Later in the winter and into early spring, fish in the high-teens and even 20-pound range start showing in the catch, especially in areas with healthy baitfish populations, where the livin’ is easy and the growth rate is fast for these fish that are always on the prowl for food. Locating baitfish concentrations is, in fact, a big key to catching winter Blackmouth. These are the hungry teenagers of the salmon world, and they spend a lot of their time looking for an open refrigerator door to stick their hungry snouts into. Herring and other baitfish tend to concentrate and disperse as the tides and currents change, especially along the edges of drop-offs and current breaks, and the salmon key in on these fluctuating bait schools as though responding to a dinner bell. That’s why it’s not unusual for a day of Blackmouth fishing to start out with some solid action around the first hour or two of daylight, followed by slow fishing for perhaps several hours, then a hellacious bite before, during or shortly after a tide change. Finding and fishing the right depth is also an important factor in successful Blackmouth fishing. Herring, squid and some of the other tasty morsels that Blackmouth enjoy for breakfast are often found in the mid- to upper reaches of the water column early in the day, then settle or disperse into deeper water as the sun gets higher on the water. The Blackmouth usually go with them. A good strategy is to watch your depth sounder closely and keep at least one line at or just under whatever level seems to be showing the most bait and/or the most salmon marks. If you aren’t marking much in the way of suspended bait or salmon, it’s better to fish deeper rather than shallower. In fact, many Blackmouth trollers always have at least one downrigger ball bouncing the bottom or tracking along within a few feet of it. It’s probably safe to say that over the long haul more of these winter chinook are caught from within 10 or 15 feet of the bottom than from the rest of the water column. 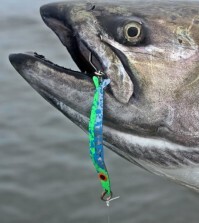 Mooching and vertical jigging both can be effective techniques for Blackmouth, and account for some very good catches in a number of popular Blackmouth spots in the Strait, San Juans and Puget Sound, but downrigger trolling is the most popular and productive fishing technique throughout much of Blackmouth country. There’s a lot more to it than simply dragging around a lead ball with a bait or lure fluttering along behind it, but rather than going into trolling techniques and tricks at great depth here, I’ll refer readers to a couple more useful articles elsewhere on this website. Check out Tom Nelson’s Handy Blackmouth Tips and Blackmouth Tips and Techniques by yours truly for some helpful information on trolling for winter Blackmouth. So let’s take a closer look not at how to catch Blackmouth but at where you might want to spend some time looking for them over the next few months. Marine Area 5, Sekiu/Pillar Point: The waters out toward the western end of the Strait of Juan de Fuca have been known for their hot late-winter Blackmouth fishing for decades, and still are worth the trip once they open to fishing in mid-February. My favorite stretch of Area 5 Blackmouth water is just off the rocky and ragged shoreline from Slip Point, at the east end of Clallam Bay, to Pillar Point, several miles to the east, but trollers also do well near “The Caves” just west of Sekiu and right out in front of Clallam Bay itself. Current regulations (2013-14) allow for a one-fish daily Chinook limit during the winter season, and that lone fish may be either a clipped or unclipped salmon. The winter/spring salmon season in Area 5 in recent years has run from the middle of February through the end of April. Marine Area 6, Eastern Strait of Juan de Fuca: This year’s winter Blackmouth season in Area 6 is already under way, having opened December 1st, and will run through April 10. This end of the Strait is home to some of the best-known and often most-productive winter Blackmouth spots to be found anywhere, including the famous “Humps” and “Winter Hole” near Port Angeles, which are often hot spots in December and January. Later in the season, from about mid-February through March, the abundant candlefish populations in places like Middle and Hein banks draw hungry Blackmouth and can produce good catches for trollers, moochers and jiggers. Regulations for this season allow anglers to take two chinook a day, provided they’re adipose-clipped. Marine Area 7, San Juan Islands: One of the most beautiful and interesting fishing spots in the Pacific Northwest can also be one of the hottest places to fish for cold-weather Chinook salmon. 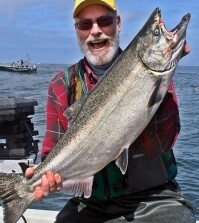 The winter fishery here typically produces a lot of large Chinook in the high-teens and 20-pound range. The Blackmouth season opened throughout the islands on December 1 and runs through the end of April, with a two-fish daily limit on fin-clipped Chinook. Part of the fun in fishing the San Juans is in the exploration itself, but if you want to increase your angling odds, spend some time trolling around the eastern entrance to Thatcher Pass (between Decatur and Blakely islands), Point Lawrence (north end of Rosario Strait), the west side of Cypress Island, especially Tide Point, and Salmon Bank (south end of San Juan Island). Marine Area 8, Deception Pass to the southeast corner of Whidbey Island: Although broken into two management areas (8-1 and 8-2) by WDFW, this large strip of inland waterways between Whidbey Island and the I-5 corridor north of Seattle operates under one set of season and limit regulations during the winter salmon season. The six-month season opened November 1 and runs all the way through April, with a two-fish limit on adipose-clipped chinook. Areas 8-1 and 8-2 include the waters of Skagit Bay, Saratoga Passage, Port Susan and Port Gardner, with Blackmouth to be found in all of them. Among the traditional wintertime hot spots are East Point and Sandy Point (near the southeast corner of Whidbey), Camano Head (south tip of Camano Island), Hat Island and Rocky Point (northwest corner of Camano). Marine Area 9, Admiralty Inlet: If I’m ever in the position of having to pick only one Washington marine area to fish for Blackmouth—and I hope that never happens—it would probably have to be this one. From Mid-Channel Bank at the north end to Apple Cove Point at the south, if you can’t find a place to catch salmon here during the Blackmouth season, you aren’t trying very hard. 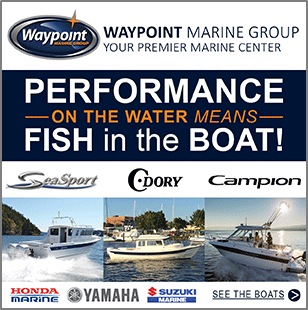 The options include places like Foulweather Bluff, Double Bluff, Point No Point and, oh yeah, did I mention Possession Point, arguably the premier winter Blackmouth fishing grounds of the Puget Sound area? 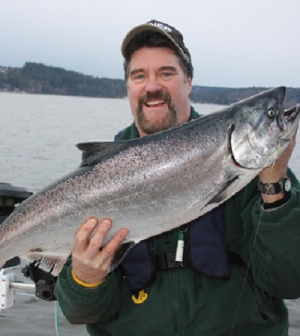 There’s decent Blackmouth fishing in Admiralty Inlet during November, but things really get going when Chinook fishing re-opens in mid-January, and it often stays good until things close down in mid-April. During that time, the standard limit of two fin-clipped Chinook is in effect. 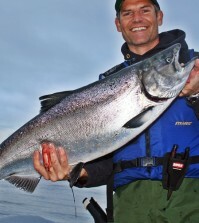 Marine Area 10, Seattle/Bremerton: The Blackmouth fishing can be as good here at Seattle’s doorstep as anywhere in Puget Sound salmon country, but don’t wait too long to give it a try. The winter season in Area 10 comes to a close at the end of January, so start making those plans now. Unclipped Chinook must be released, and the daily limit is two fish. Places that were Blackmouth favorites back in the seventies and eighties—Jefferson Head, Point Monroe, West Point, even Elliott Bay—are still very much worth fishing these days. Marine Area 11, Tacoma/Vashon Island: It just might be that the biggest challenge for winter Blackmouth anglers in the Tacoma area is getting a firm handle on the season dates and varying regulations that apply here. The winter season here is split, so you can fish Blackmouth during November and December, sit through a month-long closure in January, then go after ‘em again February 1 through April 30. The two parts of the winter season also have different rules. 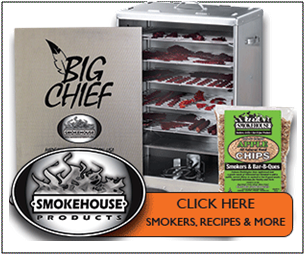 During November and December you can keep either clipped or unclipped chinook, but the daily limit is only one fish. Beginning in February, the limit bumps to two, but both must be adipose-clipped. The traditional go-to Blackmouth spot around Tacoma is Point Defiance, where the Tacoma Narrows, Colvos Passage and Commencement Bay converge. The “Slag Pile” area to the east, Point Dalco and Point Richmond to the north are other decent possibilities. Marine Area 12, Hood Canal: As in Area 11, the Hood Canal Blackmouth season is a split one, open for two and a half months through December, closed in January, and re-opening for three months beginning February 1st. 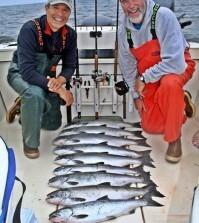 Unlike the Tacoma area, though, you can keep two fin-clipped Chinook a day during both parts of the season. And during the entire time it’s open there is no shortage of places to look for Blackmouth. As for where to try your luck, the options include Hazel Point, Seabeck Bay, Misery Point, Seal rock, McDonald Cove and others. Marine Area 13, South Puget Sound: There are lots of opportunities for Blackmouth anglers here in this only Washington marine area with an open Chinook season 12 months out of the year, and most of the year you’re allowed a couple of them a day. The exception is from January through April, when the daily limit drops to one. The good news is that the one fish doesn’t have to be adipose-clipped. Productive south-sound winter Blackmouth spots include (north to south) Point Fosdick, Fox Point, Lyle Point, Devil’s Head and Johnson Point.